No expense has been spared in the design and fitting of our beautiful, unique and individually appointed luxury home. Comfortably accommodating up to 14 guests, our home provides both central heating and air-conditioning. You will find the furnishings luxurious and the d�cor tasteful. With a south-westerly aspect and overlooking a wooded conservation area, the house has a fully screened pool and spa which is bathed in sunshine throughout the day. For those who prefer to relax in the shade there is an extended lanai which is an oversized decking area. In the evening the swimming pool and lanai are both fully illuminated and with the option of heating available in both the swimming pool and Jacuzzi spa if required. Free high speed wireless internet is also included � just bring your laptop to get connected! 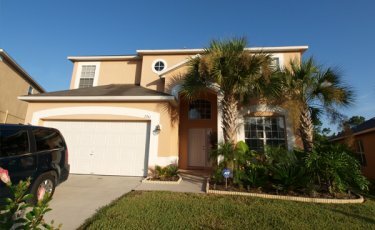 In addition there is a security alarm system and a safe. The villa offers two living areas, so there is plenty of room in which to relax. Both benefit from large flat screen televisions, for the young at heart there is also a PlayStation 2 with a selection of games, also reading books or board games for quiet relaxation times. The large kitchen dinner is fitted with an extensive range of modern appliances including a large electric cooker, dishwasher, microwave and a large fridge freezer with ice maker. For those busy mornings before the parks there is also a breakfast area which leads to the extended lanai and pool through patio doors. For more formal eating or special occasions make the most of the luxurious family dining area. Situated on the ground floor, the master bedroom is the ultimate in luxury with king size bed and spacious walk in wardrobe. It also features an en-suite bathroom with double shower and corner tub. On the second floor you will find another king-size bedroom with walk in wardrobe and en-suite facilities. Also on the second floor are two queen-size bedrooms which share a bathroom and two twin rooms, sharing the 4th bathroom. All rooms are beautifully decorated with handpicked furnishings and all have televisions. 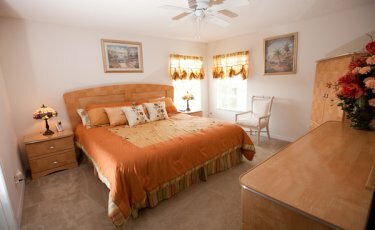 All bedrooms have air conditioning as well as ceiling fans for your added comfort. The den is also equipped with telephone, television and Wi-Fi Internet connection. For larger parties, you are able to convert the den into a bedroom, with the queen-size sofa-bed. Adults and children alike will want to spend hours enjoying all these facilities. Originally a double garage, this conversion is now a state of the art, fully equipped games room with air conditioning. Games include Foosball, a Full size Pool table, air hockey table, pinball, and Darts Board. For added entertainment there is also a television with DVD player and a cocktail bar with chairs. 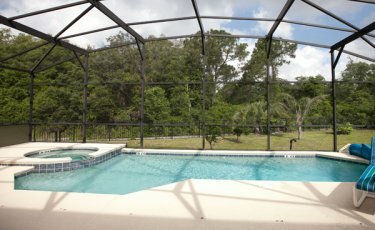 For ultimate relaxation, the pool area is backing onto conservation land and has the benefit of privacy screening down both sides of the enclosure, with an extended decking, a large lanai, Jacuzzi spa outside shower and sun loungers you will have hours of fun and pleasure here . For the younger guests in mind there is the added safety fencing to the front of the pool. There is a large patio dining table for al-fresco dining, and a small drinks table ideal for your evening cocktails by the illuminated pool on the decking area! We even provide extra towels for the pool and spa � this home has all you need for a perfect magical vacation. Leading into the games room, the Utility room contains a large washing machine and separate tumble dryer. There is also a further separate W.C and basin. 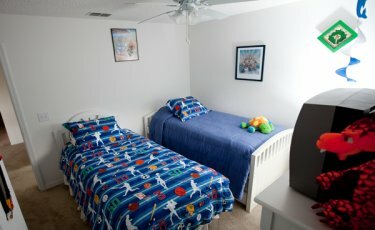 For your convenience, the villa is also equipped with the essentials for toddlers including a highchair, and travel cot.